Considering a subscription to this meal delivery service? 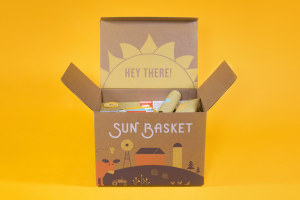 Read our Sun Basket reviews to discover if it’s really worth it! Learn more about their pricing plans, the quality and freshness of ingredients, and get your hands on some of their exclusive saving opportunities. This isn’t the only meal kit around – check out our list of food subscription boxes to discover more of the best services to subscribe to! How awesome would it be to get meals delivered right to your door? I know how this feels — I recently subscribed to the Sun Basket vegan meal plan service! They send out weekly boxes with all the ingredients you need to cook their featured recipes. These meals change each week, and there are plenty of diet options to choose from. I figured it’d be fun to try out a meal plan delivery service like this, so I signed up for a week of delivery to test it out. That said, my Sun Basket reviews will share the meals I get, update coupon opportunities, as well as compare it with similar services. This first one also shares pricing details and other essential information! The Sun Basket website is very informal and easy to navigate. They have a fun ‘explore’ page with all kinds of recipes, videos, and food-related tips you can immerse yourself in. After subscribing and creating your Sun Basket login, you’re able to see the upcoming meals you’ll receive by clicking on “My menu” link at the top. Here, you can modify your order if you decide you want different recipes. However, note that you have until the Wednesday before your delivery date by 12 PM Pacific Time (3 PM Eastern Time) to make any changes. Furthermore, besides the Sun Basket prices, you’ll also find a detailed page that outlines their values and beliefs, which I’m always excited to see because I love supporting companies that have good values. They’re dedicated to clean ingredients – 100% certified organic and non-GMO – and sustainable practices. These include giving back to the community, shipping with completely recyclable packaging, using low-impact fishing methods, and using sustainable farming practices. I was surprised by the variety of different and creative meals they come up with. You can browse all of the weekly recipes and choose what you want to be delivered. As mentioned earlier, if you decide you don’t want any of the meals they offer for the week, you can simply choose to skip that weekly order and see if you like their future offer. The only catch is that you must select it before the Wednesday before your delivery date. What’s more, if you forget to skip an order by the deadline, they provide a one-time $20 credit to your account which will serve as your very own Sun Basket promo code. If this isn’t amazing customer service, I don’t know what is! Essentially, they will ship you the meals anyway and still give you a partial refund for your own mistake! Moreover, they send text message alerts that remind you when the cutoff time is approaching. And if that wasn’t enough – there’s an app for that, as well! Aside from receiving reminders, you can also use the Sun Basket app to easily track your order from your phone. What type of meal plans can you get with Sun Basket? Pescetarian, vegan, paleo, gluten-free, vegetarian, Mediterranean, diabetes-friendly, or lean and clean plans are available. You’re required to pick one when you sign up, but you can mix and match recipes from different diets whenever you’d like. The flexibility they provide when it comes to diet options is yet another highlight of this Sun Basket review! Although they offer more diet options than I’ve seen compared to competitors, I think it would be fantastic if they also provided the opportunity to mix two diet plans (such as gluten-free and vegan). However, some of the recipes do happen to combine different diets occasionally. For instance, I’ll be getting two Sun Basket meals that are both vegan and gluten-free in my first box. Also, they offer the ability to forward your box to a temporary address if you’re traveling or have just temporarily relocated. You could also forward it to a friend or family member for them to try, or even choose to donate it to Feeding America. The weekly cost for Sun Basket varies on what type of subscription you opt for. You can choose a plan for two people with two recipes per week at $12.99 per serving; three recipes per week at $11.99 per serving; or four meals per week at $10.99 for each serving. You can also choose the plan for four people per week for the same prices. Furthermore, there’s a family plan for four people where you can get two, three, or four Sun Basket recipes per week at $10.99 per serving. The only difference with the family plan is that there are six recipes to choose from each week rather than 18. With the coupon I received, the total order amount came to only $36.94 for the first week. I ordered three recipes per week for two people, and delivery was included for free. However, shipping is only free for the first order and normally costs $5.99 per week. That said, the Sun Basket prices may seem a bit spendy at first. However, when you do the math, they’re comparable to prices of eating out or using Postmates. And if we’re honest, many of us already do both multiple times a week. 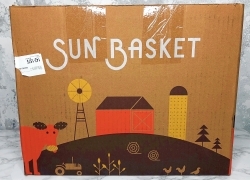 Sun Basket has substantial competition. A few of the popular competing companies are HelloFresh, Plated, Home Chef, Blue Apron, Purple Carrot, and more. I’ve researched and tried many of these options, and it seems like Sun Basket has the most extensive variety of plans to fit anyone’s diet. However, most of these subscriptions offer intro deals as well, so it might make sense to try a few different ones to save some money and see which one fits your lifestyle best. 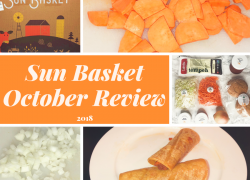 If you’d like to compare Sun Basket vs Blue Apron, check out our Blue Apron reviews to see how we rate this box! Like myself, most people who’ve tried both recommended Sun Basket due to the variety of recipes and general quality of their meals. However, Blue Apron offers the same $50 off deal for the first two weeks, so this is an inexpensive opportunity to try both and compare the two side-by-side. From what I’ve seen from their website and Sun Basket reviews from customers, this subscription box service is the most customizable when it comes to diet options. On the other hand, Blue Apron only has two options – classic or vegetarian. Since I’m vegan, I’ll be ordering vegetarian and do a little substituting with the ingredients I have at home. That being said, I don’t think I’d try out Blue Apron if they didn’t have such a great intro deal. You can purchase your subscription using any major credit card or a gift card. If someone gifted you a box or gift card, all you have to do to redeem it is provide the code you received at checkout.